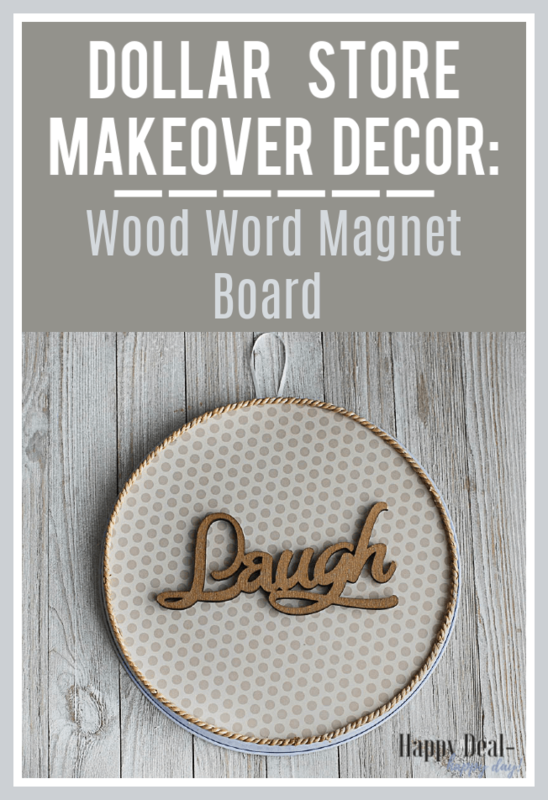 Dollar Store Decor: Wood Word Magnet Board | Happy Deal - Happy Day! 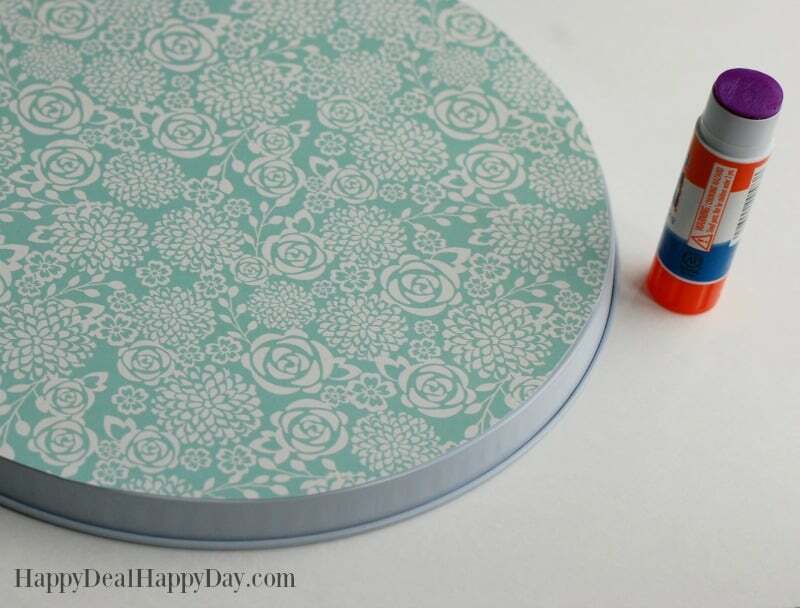 Here is a very frugal and very cute Dollar store decor where I show you how to make a handmade decorative magnetic board by upcycling an oven cover from the Dollar Tree! 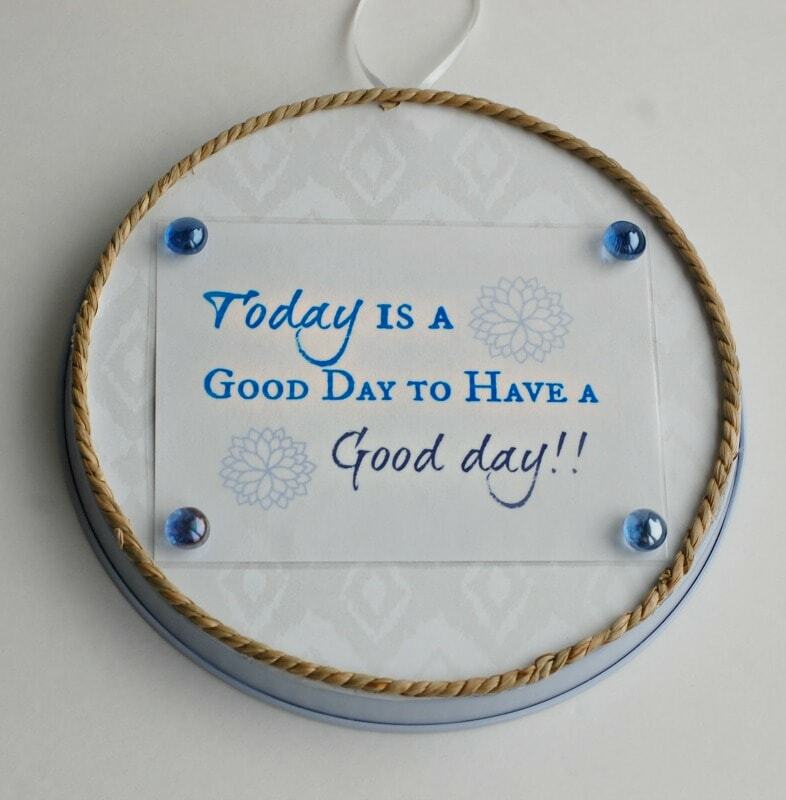 This DIY magnetic board can be used to display inspirational or funny quotes, wooden words, or your photos! 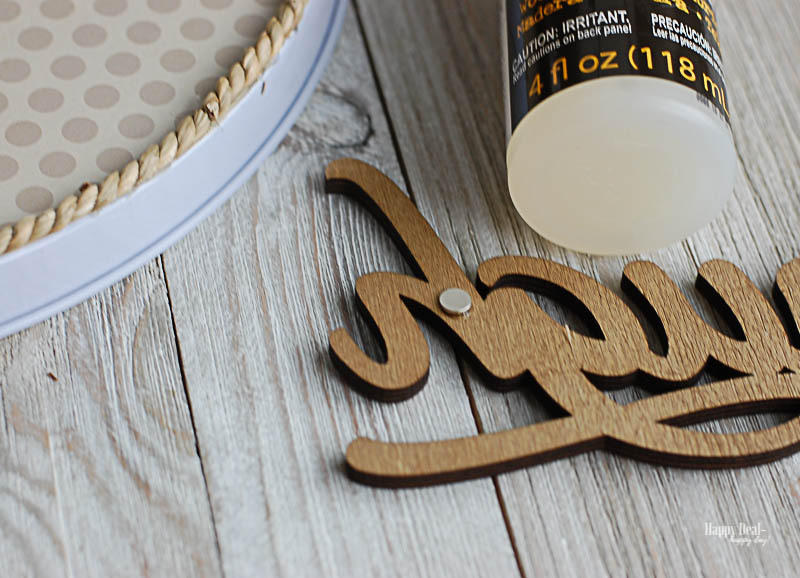 You need to get your hot glue gun and glue on some thin white ribbon (about 4″ long) that you will use to hang your magnetic board when it is done. 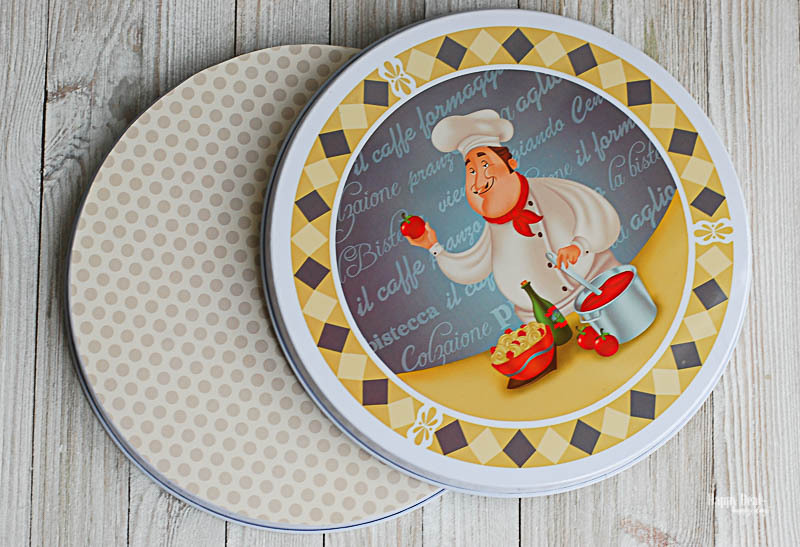 Find a sheet of scrapbook paper that you’d like the background of your magnetic board to be. 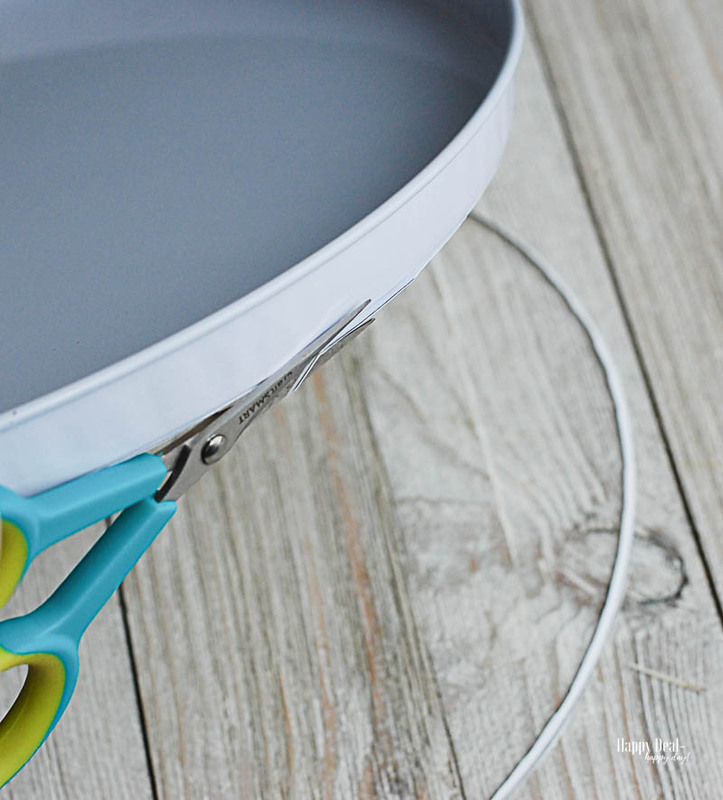 Then simply trace the stove cover on the 12×12″ scrapbook paper. 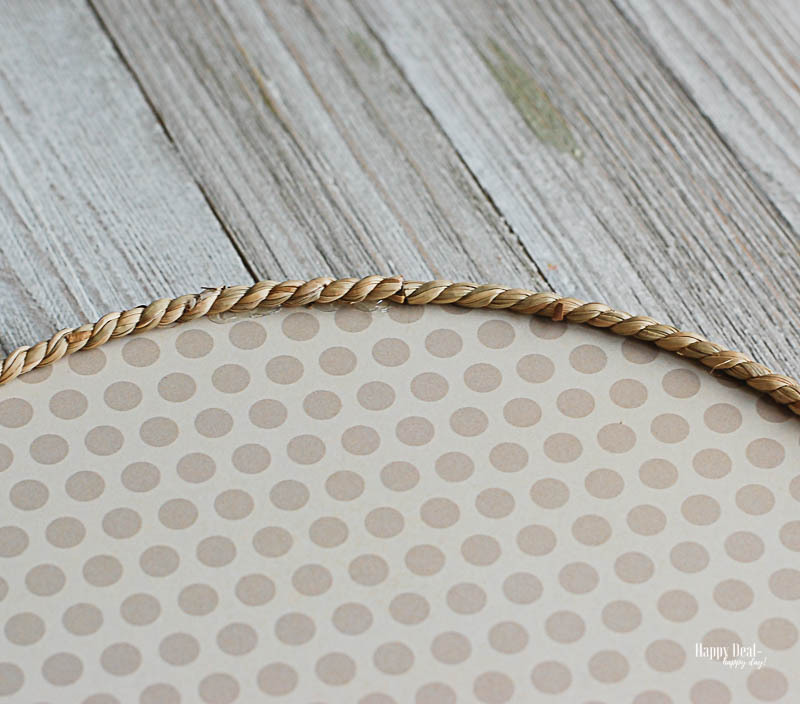 Cut out the circle – it doesn’t have to be perfect since we are covering the edge with sea grass rope. I sometimes need to use some small scissors and trim off any edges of paper that are hanging off of the edge a bit. 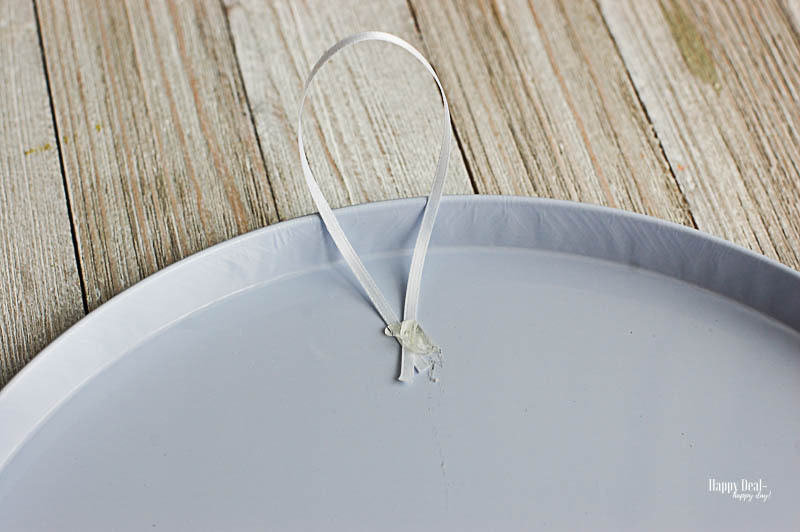 Then take about 5 inches of thin white ribbon and hot glue that to the back of the oven cover. 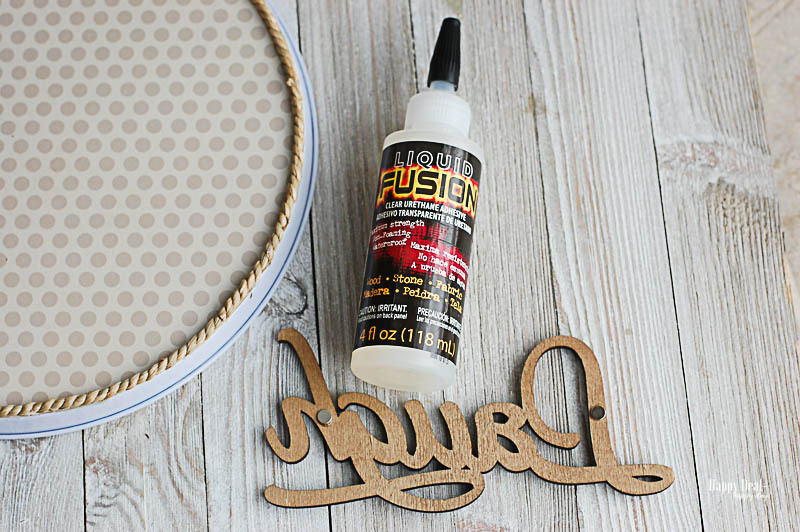 **Note: if you live in a humid and warm climate, the hot glue may not be strong enough and you’ll need something more like Liquid Fusion to hold it. Then cut the length of sea grass rope that will become the border of the oven cover. The larger 10″ covers need about 31″ of sea grass rope. 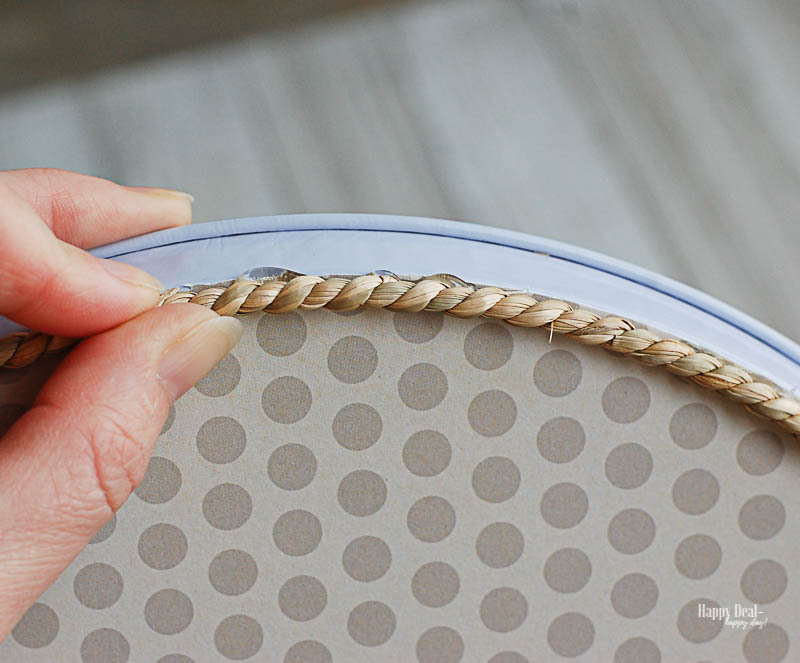 Use your hot glue gun and glue the sea grass rope down every few inches. 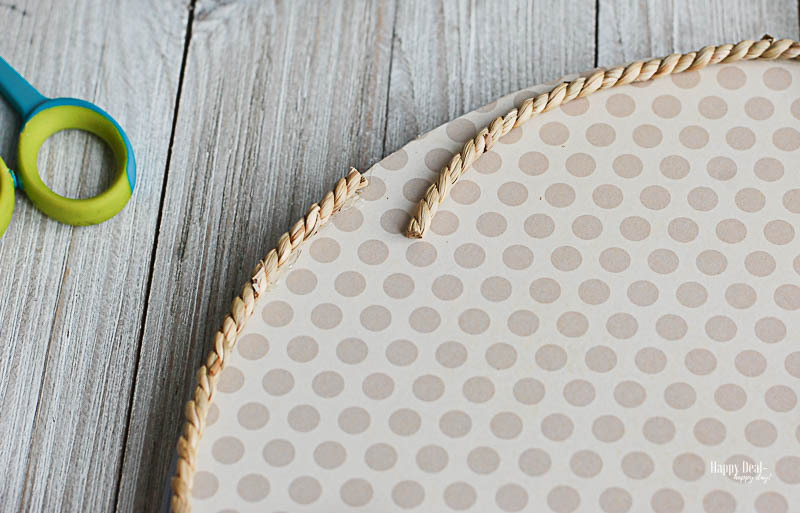 This gives it a nice clean and finished look – and can cover up any imperfect cutting of the scrapbook paper. 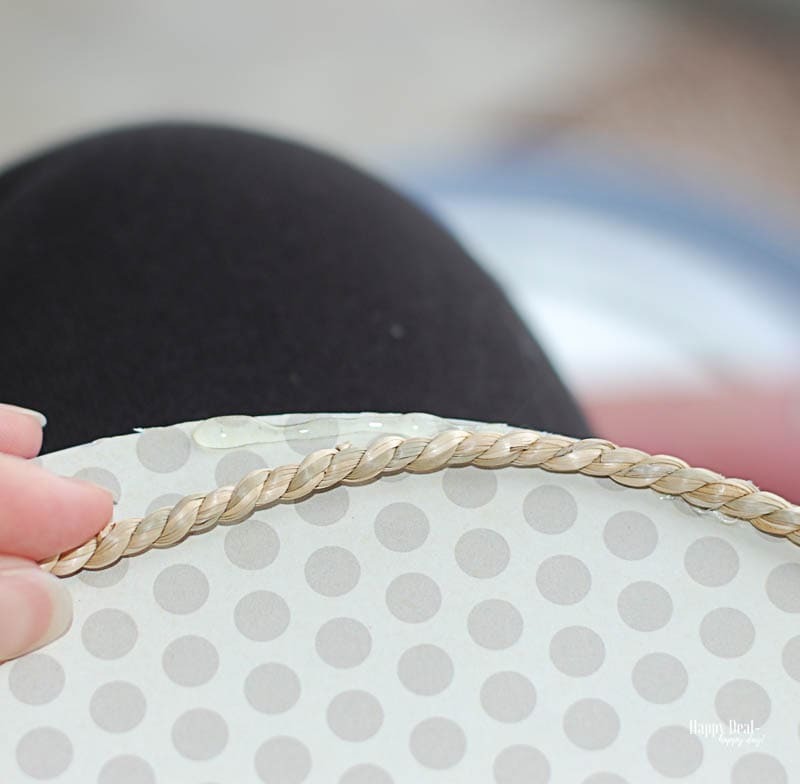 Glue the rope down all the way around the edge and trim it so that it fits nice and tight so that the seam is not noticeable. When it is hanging up, you cannot notice the seam at all! Again, if you live in a hot and humid climate, then the hot glue will not hold the grass rope forever. I also smear on a small bead of liquid fusion all along the outer edge and smooth it out with a cotton swab. 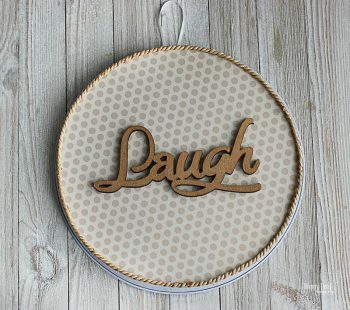 Then you’ll need to get two small rare earth magnets and use Liquid Fusion to glue them onto the back of your wooden word. 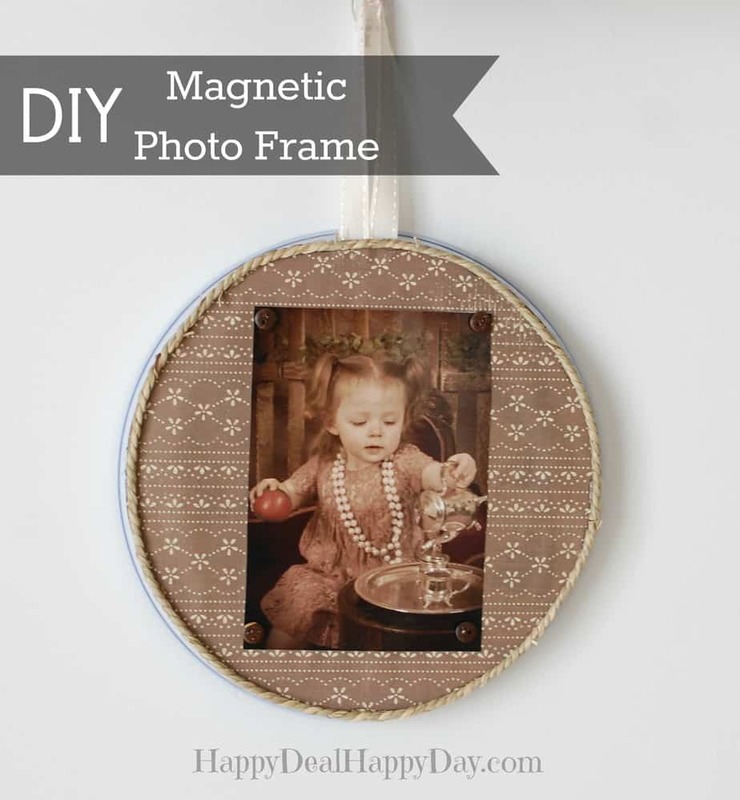 Let the magnets dry for a full 24 hours before attaching it to your magnet board. But when you do, it will be so cute! 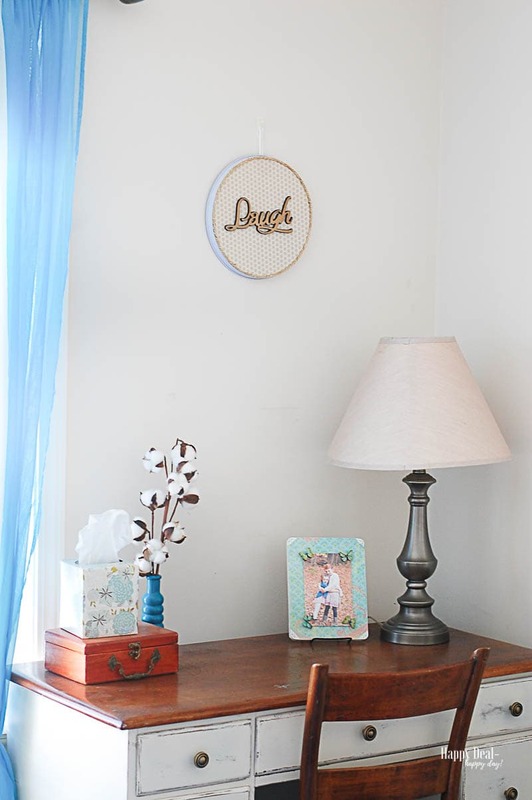 Here is mine in my guest room where I had lots of fun making over some old furniture. Check out those guest room makeover projects here! If this is a project looks like fun, and you’ll pin, but probably never make – then I have good news for you! I have some for sale over in my Handmade Amazon shop! 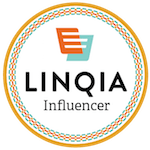 I have many other styles available – you can go browse and see my inventory.